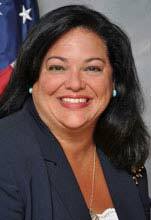 Assemblywoman Marlene Caride of Ridgefield, representing Legislative District 36, has been appointed as the new chair of the Assembly Education Committee. The position of committee chair opened when Assemblyman Patrick Diegnan moved to the state Senate in early May to fill the seat left vacant by former state Sen. Peter Barnes, who was appointed as a New Jersey Superior Court Judge. Caride, an attorney, joined the General Assembly in 2012. She also serves on the Assembly Financial Institutions and Insurance Committee, and the Intergovernmental Relations Commission. In a statement, Caride said that school funding will be the committee’s top priority. “Many of our schools are struggling to meet expectations as funding becomes more and more scarce. I look forward to working with my fellow committee members to ensure that we implement policies that will help strengthen our schools and give them the resources needed so they can adequately prepare our children for academic success.